It was Saturday and I had to work. I'm walking down K street in DC when my phone rings. It was my father in law. You could see the grin on his face from the White House. It seems Capt. Willy set out on his boat, the Sweet Sandra, around 5 AM in search of the big one. 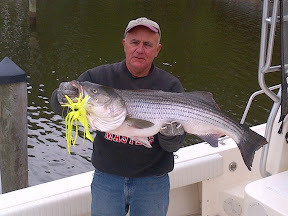 In the Chesapeake Bay, that means a rock fish (striped bass everywhere else). He put out his lines and ran a trolling rig. Not long after getting his lines in the water it was fish on. 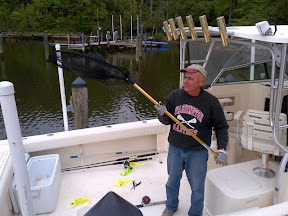 He cut the engine and fought the fish which turned out to be a beauty. Home by 7:30, it was an epic day for Bill on the Bay. 41 inches and 23 lbs. Not bad, Capt. Bill. Next time we're gonna get a fly rod in your hand!